The demand within the global honeycomb packaging market is expected to expand on account of the need to transport fragile objects, finds Transparency Market Research (TMR). Honeycomb packaging is believed to be extremely effective and safe as against other forms of manufacturing. The vendors within the global honeycomb packaging market initially entered the market due to the nascence of this form of packaging. 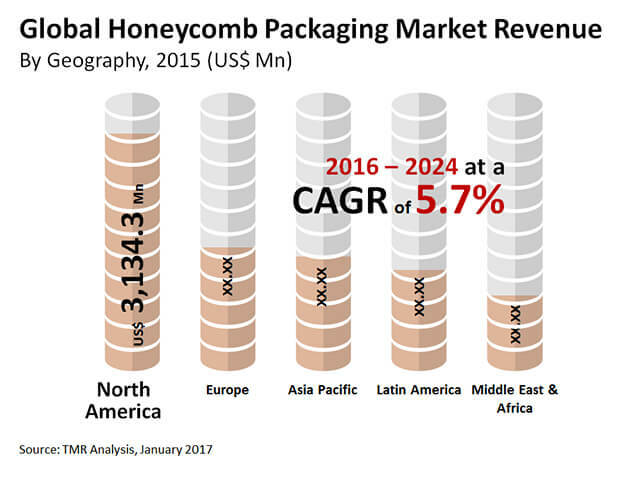 Over the years, the key vendors in the global honeycomb packaging market have developed unique packaging products and services to asset their relevance. Hence, the revenue index of these vendors in the global honeycomb packaging market is projected to improve in the years to come. The leading vendors in the global honeycomb packaging market have followed an all-inclusive approach to growth and advancements. These vendors have infused a mix of marketing hacks, research expertise, and business supremacy in order to retain their position in the market. It is expected that the leading vendors within the global honeycomb packaging market would go an extra mile and acquire the smaller vendors in the years to come. Some of the leading players in the global honeycomb packaging market are BASF SE, Sonoco Products Company, Sealed Air Corporation, ACH Foam Technologies, Inc., and Lsquare Eco-Products Pvt. Ltd.
Transparency Market Research (TMR) finds that the global market for honeycomb packaging would expand at a stellar CAGR of 5.7% over the period between 2016 and 2024. Furthermore, the global honeycomb packaging market is expected to accumulate revenues worth US$14.1 bn by 2024-end, rising up from a value of US$8.6 bn in 2015. On the basis of end-use, the food and beverages industry has emerged as a key consumer of honeycomb packaging. On the basis of geography, the demand for honeycomb packaging in North America is projected to rise at a robust rate. The emergence of several new e-commerce platforms that guarantee safe and sound delivery of goods is a prominent trend in the contemporary times. The need to prevent damage of transported goods, products, and items necessitates shock-proof packaging. Since honeycomb packaging is the most resistant form of packaging, the demand for honeycomb packaging materials has been on a rise. E-commerce vendors provide the option of returning goods if the latter are damaged, and the vendors could suffer substantial losses due to such events. Hence, these vendors use honeycomb packaging in order to minimize the possibility of goods being damaged during transportation. Transport of industrial goods is preceded by rigorous packaging logistics in order to ensure safe delivery of goods. Honeycomb packaging has been approved by several industrial analysts for the packaging for industrial goods and items. Hence, growth of the industrial sector shall invariably bring in voluminous revenues into the global honeycomb packaging market. Furthermore, consumer goods also undergo honeycomb packaging before being transported, and this has in turn propelled market demand. The emergence of well-developed distribution networks for industrial and commercial goods has also created commendable growth opportunities within the global honeycomb packaging market. The review is based on TMR’s report titled, “Honeycomb Packaging Market (Packaging Type - Interior Packaging, Exterior Packaging, and Pallets; End Use - Food & Beverage, Automotive Goods, Furniture, Consumer Goods, Industrial Goods, and Logistics Packaging) - Global Industry Analysis, Size, Share, Growth, Trends and Forecast 2016 – 2024”.